Promo code is valid on mobile prepaid, mobile postpaid, dth, datacard recharge, landline transactions of Rs. 50 or more. Promo code is valid on mobile prepaid, mobile postpaid, DTH, data card recharge, landline transactions of Rs. 50 or more. * Customer will receive a coupon code by mail after purchasing this deal. * Use the code received on mail while Paying your bill or doing recharge. * Promo code is valid on mobile prepaid, mobile postpaid, dth, datacard recharge, landline transactions of Rs. 50 or more. * Promocode can be used only once per user/Number. * Use code MOVIE4RECHARGE to book your free movie ticket after 24 hours of successful transaction using recharge promocode. * Use special code while booking your movie tickets on Paytm to get cashback. * Special code can be used only once per user/Number. * Get cashback equal to price of 1 ticket, upto a maximum of Rs.150. * Special code will be valid only on booking at least 2 movie tickets at Paytm. * Cashback will be credited within 24 hours of a successful Paytm movie transaction. * Offer is being made purely on a best effort basis and is valid for a limited period only. * Paytm reserves its absolute right to withdraw and/or alter any of the terms and conditions of the offer at any time without prior notice. * Without using the coupon code received in the mail while paying the bill or doing recharge, the customer won't be able to use the code 'MOVIE4RECHARGE' while booking movie also. 4. 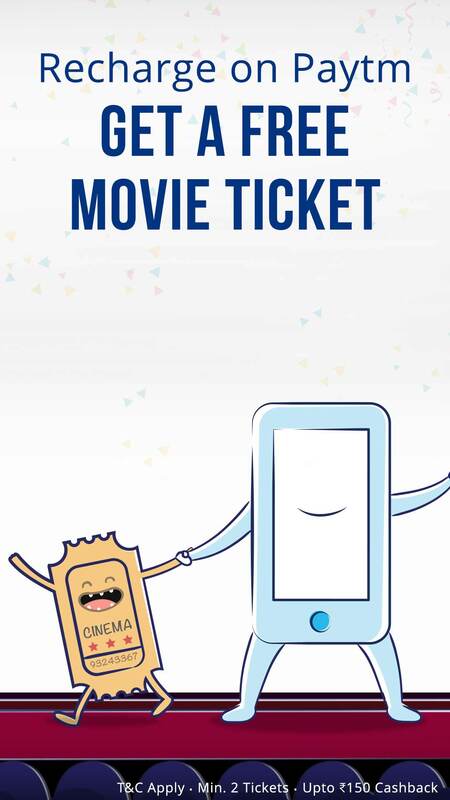 Use the code 'MOVIE4RECHARGE' while booking movie to get the cashback.